Add decorative style within your facility. 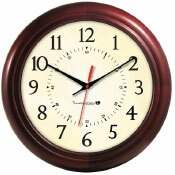 Solid Wood Clocks are the perfect look for your Executive/Administration offices and conference rooms. 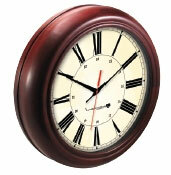 Offered in rich looking Mahogany, Light Walnut,and complimented with Arabic or Roman dials. Learn more. 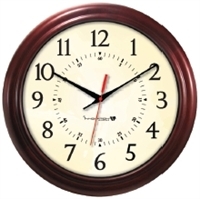 When our customers purchase our wireless synchronized clock system we also offer them an extensive clock selection such as wood analog clocks. Our KRONOsync clock system allows you to mix and match the type and styles of the clocks throughout your facility and they all will be synchronized to the same time all the time. Our beautiful wood clocks are solid wood not just veneer. Our solid wood frame delivers the richness you would expect in a wood analog clock. These clocks enhance the overall image of a facility. They can be used anywhere in a facility that needs a particular high end look. 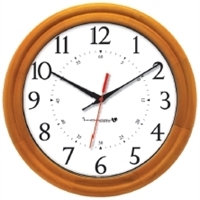 Typically these wood clocks are used in executive offices and conference rooms. We also offer additional security and protection for all of our wall mounted analog clocks with our hangers brackets. Many schools that have our clock system will add the wood clocks for their teacher parent conference rooms or to the school district offices. Hospital will place these clocks in conference rooms and in delivery rooms to create a soft and appealing environment. The clocks are offered in two different woods mahogany and light walnut. The mahogany is a darker wood and can go with virtually any interior. The light walnut provides an excellent chose to match certain décor. There are 3 dial face options for either the mahogany or light walnut wood clocks; Standard Arabic, Antique Arabic and Antique Roman. 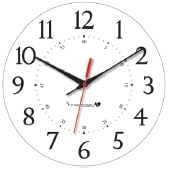 The clocks can be order in a 13″ or a 16″ size. These clocks are simple to install and synchronized with the master clock system. Our master clock system is the KRONOsync transmitter. The transmitter broadcast an up-to-date time code every 20 second seven days a week. Additionally, the transmitter is set to adjust for daylight saving time automatically for every place in the world. If daylight savings time is not required in a country or in a state, such as Arizona it is easily turned off with a push of a button. The wood clocks are battery operated. They require two standard D Cell batteries. Once the KRONOsync transmitter is operational and broadcasting it is quite simple to get the wood clocks synchronized to the correct time. The first step is to remove the battery compartment cover and install the batteries and hang the clock on the wall. Immediately the clock will start its start up procedure. Upon power up the clock’s hour, minute and second hand will be set at the 12:00 o’clock position. This provides the starting point enabling the IC board to know where its hands are located. Once this is completed the receiver module opens and receives the time code from the transmitter and sets the time to the time code. The clock will opens 6 times a day to ensure that it is displaying accurate time. During the spring time change and the fall time change the clock will automatically adjust for daylight saving time. Combining the automatic adjustment for daylight savings time and that the 2 D cell batteries will last approximately five years once you place the clock on the wall you have a maintenance free clock system. For additional information on our wood clocks or other time and communication products we offer please give us a call at: 888-559-5565.